How many of you do something for those less fortunate than you at this time of year? Do you support local families by buying those pre-filled grocery bags at Raleys and Safeway? Do you donate toys for tots or volunteer with Bread and Broth or Project MANA? Do you buy pajamas and other items to give to Live Violence Free or Tahoe Youth and Family Services? To those of you who do — thank you! These are important organizations doing great work in our community and your efforts at this time of year really make a difference. But what happens in March when the temperatures still hover in the upper ‘20s and ‘30s? When kids are wearing sweatshirts instead of heavy coats? Or when hours start to get cut back at work as the tourists begin to think about spring beach days instead of spring skiing? There is no “season of giving” in March like there is in December. Yet many in our community face hardship issues all throughout the year — not just during the holidays. Fifty-six percent of the Tahoe Basin’s school children qualify for free and reduced lunch programs. This is in part because their parents don’t have year-round jobs and because Tahoe’s incomes are at least 6 percent lower than in comparable communities. Affordable rents and the ability to buy a home are beyond the reach of many local residents so they crowd together or live in less than optimal homes. Our neighborhoods have changed, too, with 63 percent of homes owned by those who live elsewhere — and who spend most of their time and money elsewhere — leaving a lot of vacant homes and streets. So how does the Tahoe Prosperity Center’s work fit in with these issues? The organizations mentioned above are doing much-needed work for those in poverty in our communities. The TPC’s work is focused on improving economic opportunities for everyone in Tahoe. We envision a Tahoe with less homelessness, less poverty and less paycheck-to-paycheck living. We believe that if all of our residents can thrive, then all of Tahoe’s communities will prosper. This is economic development 101 — if local residents have stable incomes, can afford to live here and even purchase a home and raise a family if they want, then our communities thrive. Our schools fill with children. Our governments provide expanded community services. And local businesses profit, even in the shoulder seasons, not just in the summer or heavy snow years. The Tahoe Prosperity Center will accomplish these goals by working toward expanding high-speed Internet and cell phone coverage around the lake so businesses can grow and hire more workers. Expanded broadband and cell coverage also ensures opportunities for new technology sector jobs and entrepreneurship programs (Connected Tahoe). We are also helping to protect our community from devastating wildfire, and subsequent economic and environmental disaster with a fire camera system (AlertTahoe). Starting in January, we will begin a new project to collaborate with area schools and colleges, businesses and jurisdictions to understand the current and future job industries for our Tahoe tourism economy (Workforce Tahoe). We will champion positive environmental redevelopment projects so that Tahoe is a great place to live — not just to visit (Community Revitalization). Finally, we will continue to monitor community and economic development in the region and report on that progress (Measuring for Prosperity). We urge you to continue to support our many worthy local organizations making a difference in our community. And we encourage you to work with us on our projects, as there is always more that can be done when we collaborate. 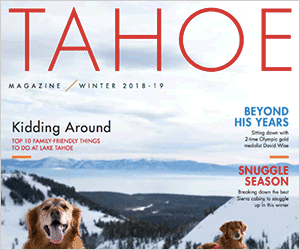 We can improve the regional economy and help all of Tahoe prosper if we work together – not just for those most in need this time of year – but all year long. Heidi Hill Drum is the executive director of the Tahoe Prosperity Center — a Tahoe Basin-wide organization dedicated to uniting Tahoe’s communities to strengthen regional prosperity. She has expertise in collaborative governance and is a 20-year resident of Tahoe. Visit tahoeprosperity.org to learn more.